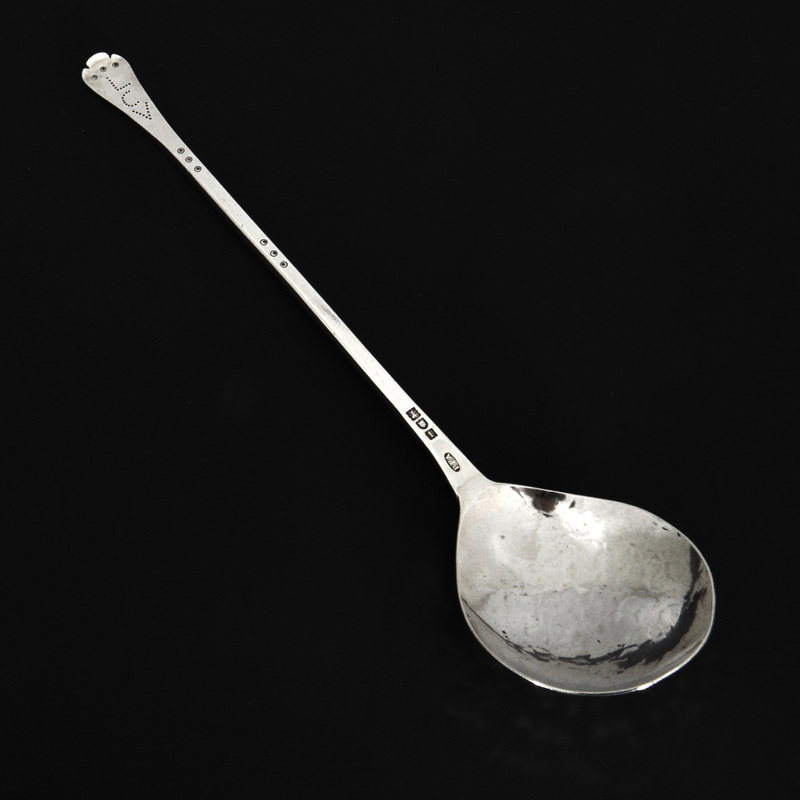 A large arts and crafts spoon by Philip Frederick Alexander. Philip Frederick Alexander was born in Hampstead, London in 1865. 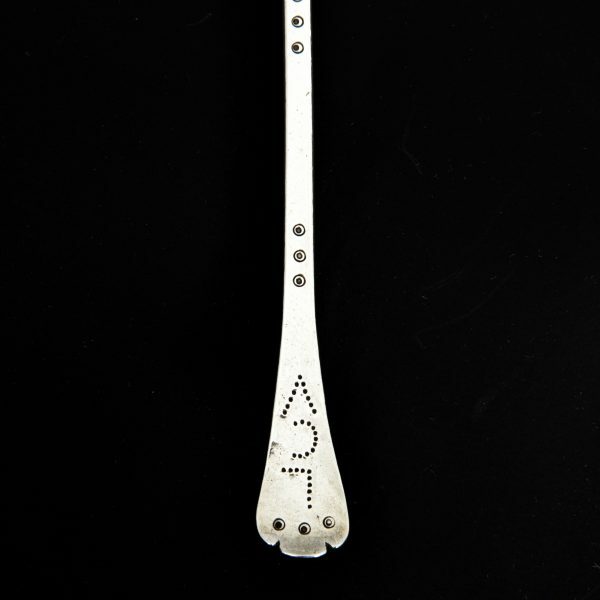 He registered his PFA mark with the London Assay Office on 6 July 1900, at which time his address was recorded as 28 Church Row, Hampstead, London NW. He entered a further similar PFA mark on 21 November 1900. He appears to have moved to Walberswick, near Southwold in Suffolk, before the First World War. In the 1911 census his occupation is described as “Artist Metalwork” and he is recorded as living at The Mill Field, Walberswick, with his wife, two daughters. He had a workshop in the garden at his Walberswick address. Silver with his PFA mark has been noted with dates between 1903 and 1921, though he may well have been active as a silversmith outside these dates. 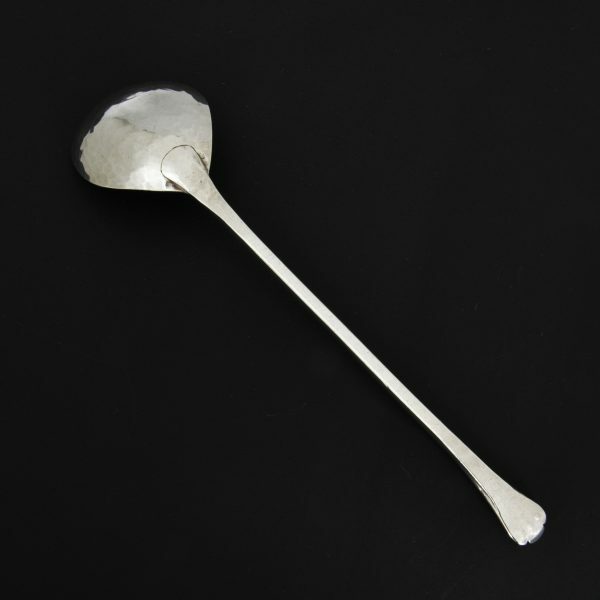 As well as working in silver, he executed work in copper and brass. One of his works in brass is the memorial in St Andrew’s Church, Walberswick, to the six Walberswick men who were killed in action during the First World War. He was also an author and school master. He edited several books including “The North-West and North-East Passages 1576-1611”, published in 1915, “The Earliest Voyages round the World 1519-1617”, published in 1916, and “The Discovery of America 1492-1584”, published in 1917. Alexander died in 1958, and his wife Frances died in 1960.